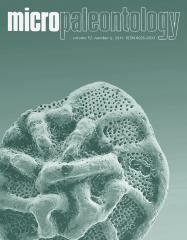 ABSTRACT: Late Carboniferous and early PermianOstracoda from the Appalachian Basin include nonmarine genera that reveal taxonomically valuable information. Coal and mudrock beds from Pennsylvania and West Virginia yielded well preserved specimens of Paleodarwinula hollandi (Scott 1944), Whipplella cuneiformis Holland 1934, Gutschickia deltoidea (Holland 1934), G. ninevehensis (Holland 1934), and Hildboldtina magnitata (Holland 1934). Previously undocumented adductor muscle scars, anterior spines, and external patterns of reticulation confirm that these nonmarine genera are distinct and suggest potential connections to theDarwinulocopina andMetacopina.Additionally, the stratigraphic range of the nonmarine assemblage highlights the potential biostratigraphic zonation for Carboniferous and Permian deposits in North America.